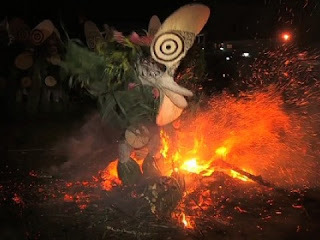 In Papua New Guinea, a spectacular National mask festival is held every year. The 2013 national mask festival was officially opened on day two in West New Britain. The day began on a higher note with the presence of the Minister of Culture and Tourism Boka Kondra and Governor Sasindran Muthuvel. The Minister was given a cultural welcome by being hoisted up onto a traditional platform carried by young men from the Masali village in the Kandrian Gloucester District. In his opening remarks, the West New Britain Governor informed the Minister and people that the festival was staged without much assistance from the ministry and congratulated his provincial administration and people for making the event a success. He also stressed that the West New Britain province makes an economic contribution through logging and oil-palm and appealed to the minister to support their initiatives to bring much infrastructural development in the West New Britain province.